The limited number of H-2B visas coupled with high demand has companies dependent on foreign seasonal workers scrambling to stay afloat. For nearly 25 years, Donnie and Michelle Massie have been on the ride of their life, traveling with their family-run carnival, Alpine Amusement, across the Midwest. But now they say it may come to an end. The Massies, like other seasonal American businesses including landscaping and crabbing, have for years relied on a federal seasonal worker program — known as H-2B visas — to keep their midway moving. But this year, they were denied the 44 visas they requested to bring in their usual workers from Mexico and South Africa. Their small business has seven full-time workers, and they were able to salvage some of their season last year when they were awarded visa workers late. Still, they estimate that they've lost almost $400,000 in revenue between last year and this year so far. Alpine Amusement's pain is one that other industries say has become acute under President Donald Trump, even in states and counties he won by promising to have the backs of small-business owners. Across the country, companies that depend on the temporary worker program have been scrambling to stay afloat because of the limited number of visas, coupled with the high demand this year. In an unprecedented move, the Trump administration shifted the program from a first-come, first-serve-based model of doling out visas to a lottery system, making it more difficult for businesses to access temporary foreign workers. Congress, which created and oversees the guest worker program, has set the limit on these visas at 66,000 and divides them between the summer and winter seasons, but has rebuffed calls to eliminate or permanently raise the cap. Instead, Congress allowed the Department of Homeland Security to make additional temporary visas available this year, the third year in a row it has done so. After facing the additional demand for H-2B workers, the Trump administration released an additional 15,000 visas in May. But it's still not enough, industry organizations and business owners say, because the entire system is badly in need of an overhaul. Thousands of miles from the Massies, Matt Davis, 40, recounts everything he did to find American workers for his Plano, Texas, landscaping business: Newspaper advertisements. Flyers in the local hardware store. Notices through the state’s unemployment office. Craigslist. Word of mouth. "If I can fill my workforce with local guys, I would do that. I want to hire Americans first because it's easier for me, but most of the American workers don't want temporary jobs," Davis told NBC News. So he turned to the visa program, applying last September to get workers by this spring. He was initially denied, but was able to get a late batch of 16 foreign workers from Mexico when the Trump administration released the extra 15,000 visas. Damage was still done — the infusion was too late and he lost about 50 percent of his revenue. 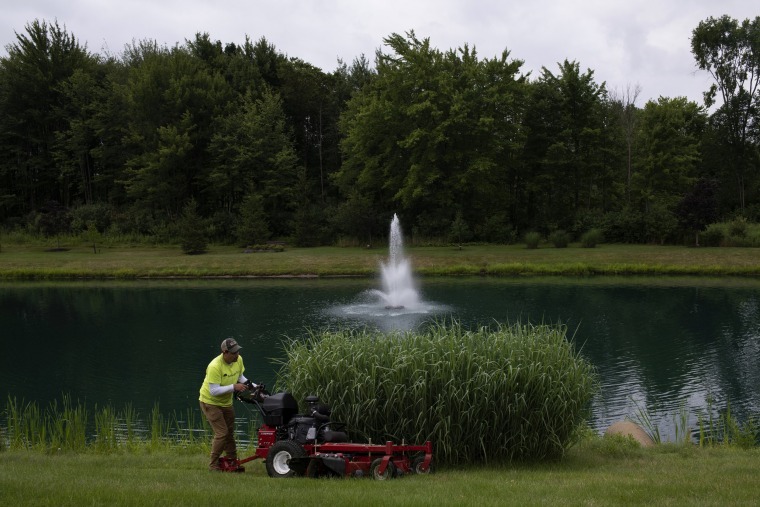 Another landscaper believes the same fate is in store for him and his Ohio-based business. George Hohman, 51, was able to secure 25 workers from Mexico in mid-July — late into his season —after the extra visas were released. Some of his customers had switched to his competitors, so he had to terminate a $50,000-a-year contract with a local marketing company and close a satellite office. He's also seen his recruitment costs skyrocket, estimating his total loss at about $250,000. Hohman said that the government has not done enough to listen to the plight of seasonal businesses that rely on the foreign visa program, and believes that the immigration debate has hindered reform efforts. Michael Bars, a spokesman for the U.S. Citizenship and Immigration Services under the Department of Homeland Security, said the agency is committed to overhauling the program, but also wants to protect American workers. “USCIS is focused on ensuring the integrity of the immigration system and protecting the interests of U.S. workers," he said in a statement. "We are committed to reforming employment-based immigration programs so they benefit the American people to the greatest extent possible." Trump has pushed "America First" and "Hire American" as policy priorities, and called small businesses vital "in creating a safe, strong and prosperous America." But the industry figures and business owners said in interviews that the current H-2B visa limits are hurting, rather than helping, the people Trump says he wants to protect. The seasonal jobs, which are usually for only a few months and often involve back-breaking labor, don't appeal to many U.S. workers, the owners said.Also, fewer guest workers can add to the burden on full-time American employees. Some of the business owners have lobbied Washington in-person and with letters, telling their representatives that they may have to close up shop if the program isn't fixed. Aubrey Vincent, 31, runs Lindy’s Seafood, a 40-year-old business in the Trump-voting crab town of Fishing Creek, Maryland. She says she has exhausted efforts to recruit American workers after receiving none of the 104 visas she requested this year. The roughly 30 local crab workers have only been able to process 25 percent of the company's normal volume of seafood, devastating her bottom line. Her full-time American employees in other departments have been working overtime to keep the business afloat. "I haven't been able to give them vacations," she said. "Everybody's working way too much, and we don't have enough hands to give everyone the relief they need." Bill Sieling, the executive director of the Chesapeake Bay Seafood Industries Association in Maryland, said that the seafood industry is particularly feeling the crunch. “Most of these companies can weather this year, but if this whole thing continues into next year, which is our nightmare scenario, you’re going to see the end of this industry,” he said. The Massies have also tried desperately to recruit American workers to their carnival business, and sometimes get college students to sign on for temporary bouts. At job fairs, Michelle says, she's advertised pay that is sometimes nearly double the local or federal minimum wage with no luck. To stay afloat, they've limited the number of rides and concessions. To keep contracts, they've partnered with other carnival companies to get enough workers to fulfill obligations, but they have still to split the profits from those deals. And they've pulled in their 17-year-old son to help keep up with work.